Millenials aren’t the only one’s connecting on the Internet. 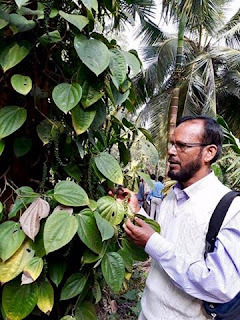 It is how Rehmat Shahiudil Islam, a farmer from Bangladesh first came across Zero Budget Natural Farming, a natural farming movement from India. He read some blogs and watched videos, and after an initial fascination with the subject decided to come to South India to attend a training camp in Karnataka early this year. ZBNF strives to end farmer’s dependence on debt by farming naturally, with nature, without any external inputs or chemicals. It aims to create self-reliance at the farm level so farmers never have to depend on any external entities – be they corporations or the government. The movement has thousands of practitioners at the national level. It has spread in an organic farmer-to-farmer way, and through massive training camps where its principle teacher Subhash Palekar– or guruji, as he is respectfully called by farmers, gives detailed classes. He is now in touch with other ZBNF farmers through Whatsapp and Facebook and can easily discuss any problems with them online. Rehmat has a job in the real estate sector but plans to quit and practice ZBNF full-time as soon as he can. He purchased some land a few years ago and now is practicing ZBNF on it. “Everyone thinks I am crazy, but I tell them, just give me six months and I will prove myself. 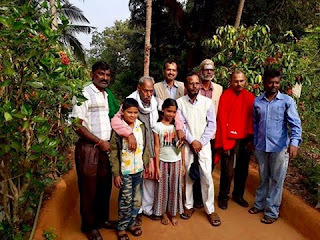 My family also questioned me in the beginning, but now they support me.” He is convinced that with each crop he will get better and learn by doing. He also wants to translate Palekar’s books to Bangla language, which is the national language of Bangladesh. Palekar has published some 20 books in various Indian languages, which are a key resource for farmers to learn about the method.